Although payments are processed by PayPal, a Paypal Account is not required. Any major credit card is accepted. This album is also available for digital download on iTunes and Amazon.com. Brothers Legends & Friends is Ronnie’s first steel guitar instrumental album. It is dedicated to John Hughey. 1 SAWED OFF SHOTGUN – This is a Rocky Caple tune from the original Pridesmen instrumental album. It features the Pridesmen and Kenny Vaughan. 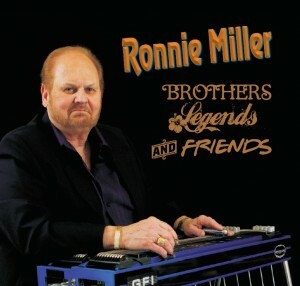 Ronnie plays this at the Texas Steel Guitar Jamboree every year. 2 A-11 – Ronnie’s instrumental version of the Johnny Paycheck version. Daryle Singletary sings on this one. 3 LOOK AT US – This Vince Gill classic had John Hughey playing a pivotal role in the song with his steel guitar. Ronnie puts his spin on the classic as an instrumental, with Vince Gill singing part of the song with him. 4 I CAN SEE CLEARLY NOW – Ronnie’s instrumental version of the Johnny Nash favorite, inspired by Lloyd Green. 5 CONWAY TWITTY – JOHN HUGHEY MEDLEY – The medley was assembled by Ronnie to pay tribute the all those great steel licks played by John Hughey on the Conway Twitty hits. Daryle Singletary sings on this medley. 6 SPINNING WHEEL – Ronnie’s instrumental version of this Blood Sweat & Tears classic. It is quite unique for a steel guitar application. 7 CRY CRY CRY – Ronnie’s instrumental version of the Connie Smith hit. Laney Hicks sings on this one. 8 LOST IN THE FEELING – This is a Conway Twitty song that had more steel guitar on it than any I ever heard. John Hughey was the original player. Of course being a huge fan of John Hughey, Ronnie has included it as an instrumental with a few lines sang by Daryle Singletary. 9 WHAT A FOOL BELIEVES – Another truly unique steel guitar instrumental version of the Doobie Brother’s smash hit. 10 WHAT A WAY TO LIVE – Ronnie’s instrumental version of the Johnny Bush favorite. Billy Martin sings on this song. 11 STEELIN’ CORN – This instrumental is from Merle Haggard’s Strangers instrumental album. It is a steel guitar/electric guitar harmony track originally recorded by Roy Nichols and Norm Hamlett. Terry Downs transcribed the guitar and steel guitar notes and included it on “The Guitar Styles of Roy Nichols” guitar instructional DVD. Ronnie had always loved that song and has included it here with Terry Downs playing the guitar part. 12 CHARLEY PRIDE MEDLEY – The medley was assembled by Ronnie to pay tribute the all those great steel licks played by Lloyd Green and others on the Great Charley Pride hits. Charley Pride sings on this medley. Let me know when the CD is ready. I’ve got to have it.